Home » Community » Football Camp In Olds on May 1 – Olds Minor Football Assoc. Football Camp In Olds on May 1 – Olds Minor Football Assoc. A one day skills camp hosted by Olds Huskies & Bulldogs Football. 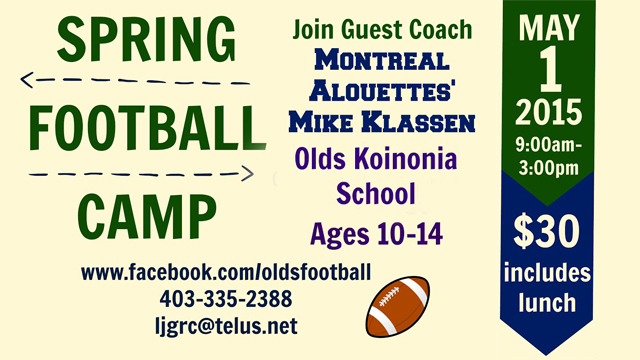 Join Mike Klassen, of the Montreal Alouettes, for a day of football skills and drills. This is a great introduction to football or a warm up to the upcoming season. No special equipment needed, just running shoes! Phone Alissa at 559-9381 or Lee-Anne at 335-2388 to pre-register, by April 30.